Gamerscore has been one of the gaming generation’s most significant hallmarks. While not exactly providing gamers with any monetary or physical rewards, the idea of having a collective score to keep track of all your achievements has proven to be a successful strategy in luring gamers to buy software for specific consoles. Microsoft found this out early in the Xbox 360’s run with Achievement Points, and Sony eventually caught on by creating Trophies. 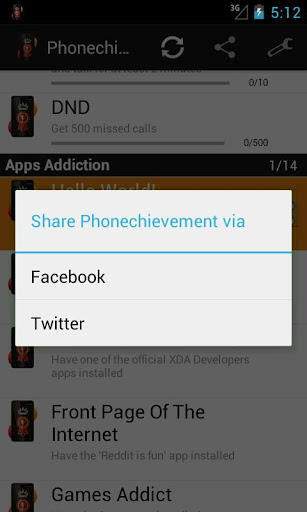 Now Android users can join in on the fun with Phoneachievements, an app created by XDA Developers. Not tied to any particular game or app, Android users can now be rewarded valueless points for the most mundane uses of their phone. 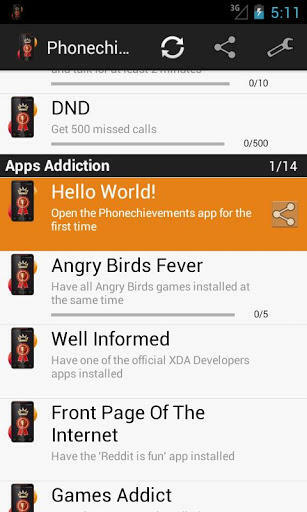 As with most Xbox and PlayStation games, some of the achievements are gimmies which can be achieved within minutes of installing the apps. Others are guaranteed to be unlocked given enough time, while others are actual goals you’ll have to set for yourself to unlock. For example, the “I Always Take The Bus” achievement will be awarded for charging only through a USB port 15 times in a row, while “The Alternative Approach” can be unlocked by charging through an AC Adapter 15 times in a row. 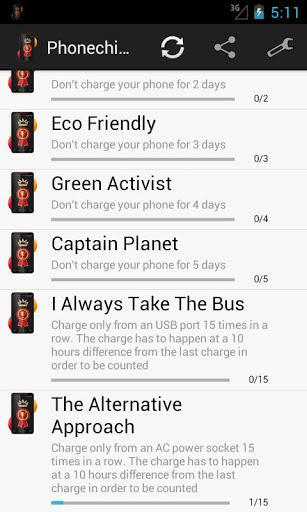 For those not really interested in using their phone, there is also the “Captain Planet” achievement, which is rewarded for not charging our phone for five days. Best to leave that one for a planned hiking trip. Immediately upon installation, I achieved the “Angry Birds Fever” reward for having all five Angry Birds games installed on my phone at one time. 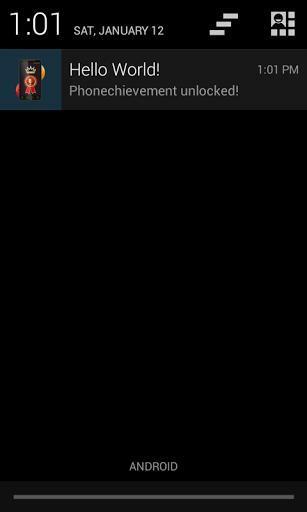 “Dedicated Tester” though will take a little while to overcome as you must install a new app everyday for 30 days, and it starts back at zero should you forget. In regards to phone calls, “Bad Day” is unlocked should nobody call you for 24 hours while “My Day Off” is for not calling anyone for 24 hours. 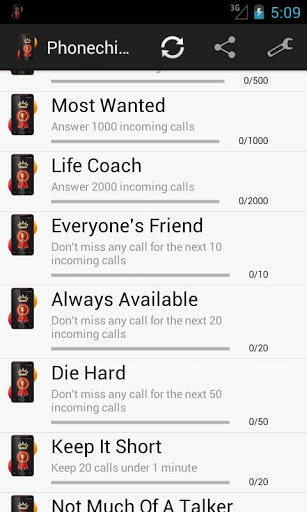 “Stalker” requires you to call the same number 10 times in a row and talk for two minutes, and then there is “Die Hard” in which you can’t miss a single incoming call for the next 50 made to you. The list of fun and interesting achievements goes on and on. Of course, the app is free and it can be synched with just about every social network out there, so you can easily brag to your friends about your useless milestones. It might be fun to mock and laugh at this ridiculous idea, but just look at how big Gamerscore turned out to be. Measuring your real life and aiming for a goal on this this app might not seem like much, but just remember its the little things in life that makes us happy. Now your life can be a video game, leaving you with goals to achieve and unlock simply by using your phone.